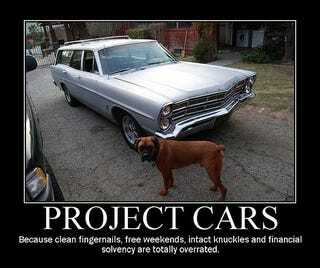 Are You A Project Car Hell Poster Child? Thing is, while a not-very-rusty '67 Ford wagon is indeed cool enough, is it hell enough for PCH? These things are built pretty well and parts aren't impossible to find. Perhaps you'll need the Project Car Hell Song playing to provide inspiration while you contemplate this momentous decision.